Dismounted knights clad in full suits of armor took the field during the Wars of the Roses, forcing dramatic changes in battlefield weapons. The men of Bridport on the coast of southwestern England kept extra weapons on hand to deal with the raids endemic during the Hundred Years War that preceded the Wars of the Roses. Just four years after the last great battle of the Hundred Years’ War was fought at Castillon, a muster was held at Bridport at the outset of the Wars of the Roses during which the town’s four principal officials, two constables and two bailiffs, assessed the equipment of individuals who presented themselves for inspection for wartime duty. One commoner in particular stood out from the rest for he had brought enough to equip himself and others. Besides two helmets and two padded jacks, he had three bows and sheaves, two poleaxes, two glaives, and two daggers. This man, unlike many others, would not be subjected to the requirements others would have to meet if they were short of the required equipment. If that were the case, they would be told to acquire the additional equipment within a fortnight or pay a fine. The three wars that constituted the Wars of the Roses had periods of peace that separated them. The name of the wars derived from the badges used by the two cadet branches of the Plantagenet dynasty: the white rose of York and the red rose of Lancaster. Supporters of the two branches shed a large amount of blood in a contest for control of the English crown. Both houses laid claim to the throne as descendants of the sons of Edward III. The Lancastrians had been on the throne since 1399 and may have remained there indefinitely were it not for the anarchy through- out the kingdom that began in the middle of the 15th century. When Henry V died in 1422, the country endured the fractious minority of Henry VI during which England was managed by the king’s council, a predominately aristocratic body. 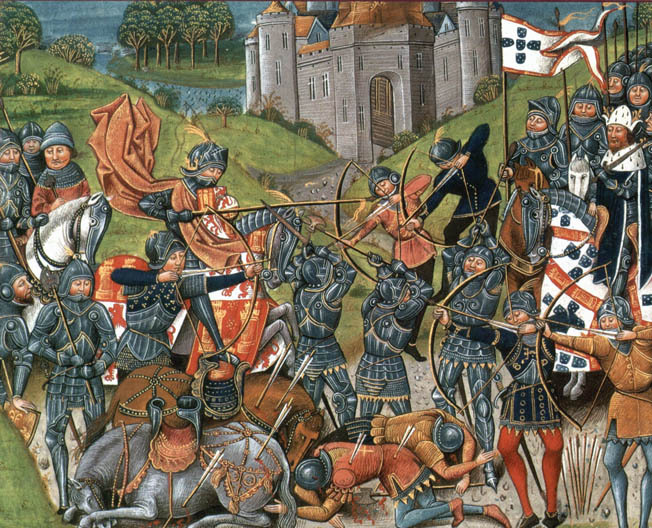 Longbowmen engage each other in a period image of the Wars of the Roses. Since both the Lancastrians and the Yorkists had longbowmen, neither side gained a clear advantage from their use. The arrangement was not main- tained without trouble. The council soon became a battleground for those attempting to gain power. Great magnates with private armies controlled the English countryside. Lawlessness became rampant, and the people began to be overtaxed. When King Henry VI lapsed into insanity in 1453, Richard Plantagenet, 3rd Duke of York, was installed as protector of the realm. When Henry recovered from his illness in 1455, he re-established authority, forcing York to take up arms for self-protection. Queen Margaret, who controlled her weak and mentally unstable husband, subsequently drove York from the royal court. In response, York rebelled against Henry VI. Armed conflict broke out at St. Albans on May 22, 1455. The Lancastrians eventually killed York, who was slain in the Battle of Wakefield in West Yorkshire on December 30, 1460. His eldest son, Edward, 4th Duke of York, however, vanquished the Lancastrians at the Battle of Towton fought March 29, 1461. After the battle, the victorious duke became King Edward IV. The second war lasted from 1469 to 1471 and its events centered on the expulsion from power of Edward IV by a military coup led by his former ally Richard, Earl of Warwick. Warwick was slain in the Battle of Barnet in 1471. The third war involved Edward’s brother Richard Plantagenet, who usurped the crown in the wake of Edward’s death in 1483. That conflict ended with the victory of Henry Tudor, the future Henry VII, over King Richard III at the Battle of Bosworth in 1485.
that armored cavalry was highly vulnerable to missile fire by highly skilled bowmen. For their part, the English knights and men-at-arms had fought on foot throughout the Hundred Years’ War, and this preference for fighting dis- mounted continued into the Wars of the Roses. Indeed, the English proved that the most effec- tive way to do battle was with dismounted infantry supported by archers armed with the devastating longbow. Typically, the wealthy knights were clad in suits of armor, men-at- arms were clad partially in armor, and levies wore leather jerkins or padded jacks. Another seminal change that differentiated warfare in the 15th century from the previous one was the refinement of plate armor. The renowned armor craftsmen of northern Italy and Germany had the requisite metallurgical skills to fashion magnificent suits of armor from steel. By the time of the Wars of the Roses, knights and men-at-arms who could afford these suits went into battle encased from head to foot in plate armor. Plate armor negated the need for shields but required offensive weapons that could punch through or tear the armor of the wealthier combatants. The English longbow, which most likely was an outgrowth of the ordinary wooden bow, played a substantially less important role in the Wars of the Roses, not only because there was no enemy cavalry to decimate, but also because the use of fluted plate armor for the most part negated the effect of arrows. Other forms of protection, such as leather jerkins or padded jacks, blunted the effect of the arrows. It was common for the archers to duel with each other at the outset of a battle and then fall back to a supporting position. Moreover, since both sides had longbowmen during the Wars of the Roses, neither side gained a clear advantage from their use. A flanged mace delivered greater force than the sword. It would have been highly useful in combat against a knight clad in plate armor. The longbow consisted of a six-foot bow usually crafted from a single piece of yew. The longbow projected arrows up to 820 feet by elasticity in the form of a spring. As the bow was drawn, energy was transformed into kinetic energy as the string was released, thus transferring energy to the arrow. A typical longbow archer carried from 60 to 72 arrows at the time of battle. A skilled English longbowmen could fire 10 to 12 arrows a minute. Archers would place their arrows either point down in the ground in front of them or through their belt to grasp them for firing in battle. In one noteworthy instance, the use of longbows did not cancel each other out in battle. At the Battle of Towton on March 29, 1461, Yorkist and Lancastrian archers engaged in an archery duel at the outset of the battle. Because the wind was at their backs, the Yorkists won the contest. Yorkist archers shot approximately 750,000 arrows in less than 10 minutes, resulting in the death or wounding of hundreds of Lancastrian troops. In this way, the Yorkist archers succeeded admirably in softening the opposing ranks before foot soldiers on both sides clashed. The primary weapon of the period for cavalry remained the lance. The word “lance” is a catchall term for a variety of different pole weapons based on the spear. The name is derived from “lancea,” a Roman auxiliaries’ javelin. The lance was designed for mounted troops. Medieval guilds manufactured both the heavy lance and the light lance. They usually were a solid shaft made of ash, cedar, or poplar. The heavy lance was 10 to 12 feet in length and was used more or less as a shock weapon. Before tactics changed in the 15th century, the purpose of the heavy lance had been to enable charging cavalry to break the enemy’s front line. A hand guard was added to the heavy lance in the 14th century. The most effective way to use a heavy lance was to hold it 30 degrees away from the centerline of the horse on either side of the neck. Two versions, one light and one heavy, were available to the mounted man-at-arms. The light lance ranged from six to 10 feet in length and had a narrower diameter than the heavy lance. Unlike the heavy lance, the light lance was designed to be either thrown like a javelin or stabbed like a spear using an overhanded thrust. 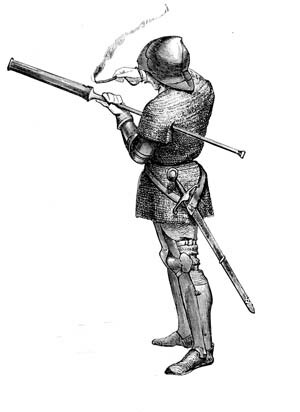 Dismounted men-at-arms during the Wars of the Roses used powerful staff weapons such as the poleax and mace for battering their armored opponents during dismounted combat. They also employed thrusting and stabbing weapons such as the sword and rondel. Local levies primarily used the billhook. The billhook was a variation of a common agricultural tool used for cutting woody material. It consisted of a hooked metal blade which was sharpened on the inner curve and mounted on a wooden shaft. The six-foot-long English version of the billhook was a combination of a broad, curved knife and an axe. The length of the blade range from eight to 10 inches, and the staff ranged from six to eight inches. The “bill,” as it was sometimes called, was a versatile close contact weapon that gave the foot soldier the ability to reach and engage a cavalryman. Using the hook, a foot soldier could hook a cavalryman and pull him to the ground. A blow from a billhook blade could inflict serious injury even to a knight protected by armor. 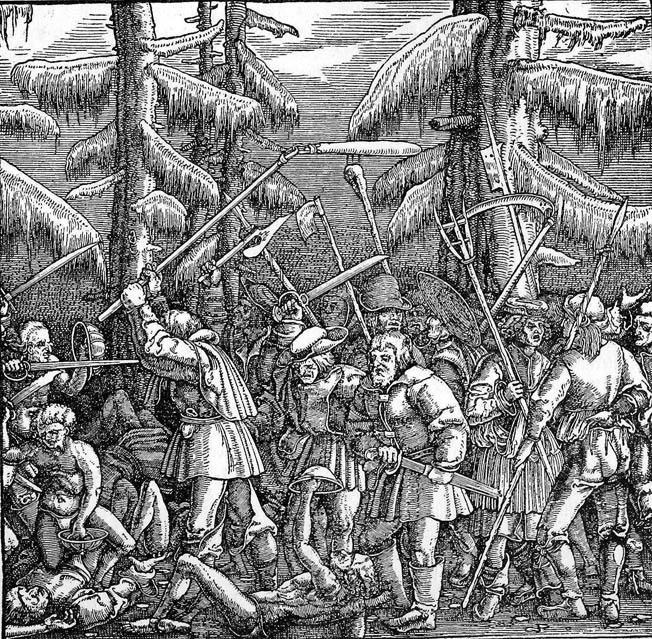 German peasants fight with a wide variety of staff weapons derived from agricultural tools. In England, the most ubiquitous of these was the billhook, which had a hooked metal blade that was sharpened on the inner curve. The poleaxe was a brutal assault weapon that was used with regularity on the 15th century battlefield, rather than sporadically as it had been used in the previous century. The poleaxe provided a way to offset the advantages afforded by fluted plate armor. Requiring strength and two hands to wield in battle, poleaxes were swung in a cleaving motion like the battle axes used by Normans and Vikings in previous centuries. A poleaxe consisted of a wooden staff up to six feet in length topped with a heavy, razor-sharp curved blade on one side, a claw-like point on the other, and a sharp spike at the top. Alternate versions had a hammer on the front end and a sharp hook on the back end. The poleaxe was intended to deliver a bone-crushing blow and also to cut through plate armor, depending on which feature of the weapon was used. Whether a knight or man-at-arms used a poleaxe against an armored or unarmored opponent, the result could be lethal. The thick blade was capable of severing limbs and the sharp point that capped the poleaxe was useful for puncturing armor. A mace was a weapon with a heavy head that might also have flanged or knobbed additions on the end of the handle. The mace generated far greater force than a sword when swung. The weapon could be mounted on either a long shaft measuring up to five feet or on a short shaft measuring one foot in length. The mace was an armor-fighting weapon designed for close combat that could be used by a man-at-arms fighting on foot or on horseback. A major advantage of the mace was that it was cheap and easy to make, which made it more numerous on the battlefield. Its primary use was for bludgeoning an opponent, and it was particularly effective against an enemy wearing plate armor. The flanged mace in particular was designed to penetrate armor. The flail, which is sometimes referred to as a mace and chain or a ball and chain, was similar to the mace. It featured a chain or strap so it could be swung with great force. In previous centuries when soldiers used shields, a soldier who was skilled with a flail could wrap the chain around an enemy’s shield and pull it away. Another staff weapon used during the Wars of the Roses was the halberd. Halberds sported a spiked axe head on a staff of similar length to the billhook. The foot soldier wielding a hal- berd swung at his opponent as he would a two-handed axe. Yet another staff weapon was the glaive, which featured a slender axe-like blade attached to a six-foot pole. Some versions of the glaive had a small hook on the reverse side used to unhorse cavalrymen. For close-quarter combat, the 15th-century man-at-arms carried a sword designed either for cutting or thrusting. Many sword designs of this period originated from those developed during the Viking and migration periods dating back to the type of iron swords wielded by pre-historic Celts. Length was the most critical factor in how a sword would be used in combat. Single-handed swords were usually 2.5 feet long, and double-handed swords were usually 3.5 feet long. Men-at-arms usually wore their sword in a scabbard on one side and a rondel dagger on the other side. In some cases, a knight would be considered “undressed” without his sword even when not in armor. Swords normally weighed only two or three pounds. A sword that was too heavy could not move fast enough to precisely strike a moving opponent and would not be controllable once it began to swing. During their manufacture, swords were carefully balanced, according to the purpose for which they were designed. Swords intended for thrusting had long, narrow blades and long hilts. The rondel dagger takes its name from the cylindrical hand guard and disc-shaped pommel and cross-guard that were equal in size. The weapon was introduced at the turn of the 14th century, and its forerunner was the knightly dagger of the two previous centuries. The rondel dagger might be, for example, 25 inches long with a 10-inch handle and a 15- inch blade. Rondel dagger handles usually were made of wood plated with metal or of metal, although wood, horn, and bone models existed, too. Rondel daggers were not meant for slashing. They featured a slender, triangular blade made of steel with a tapering point. The rondel dagger allowed the user to deliver a fatal wound to an incapacitated or pinned knight. To finish off an adversary with a fatal puncture wound, the rondel dagger was thrust through a seam or joint in a suit of armor or even through the eye slit in a helmet. Hand-held firearms were introduced in the 15th century, although they were crude and inaccurate and for the most part ineffective. These “hand-gonnes” consisted of a short tube mounted on a stick. The gunpowder was ignited with a hot coal or a piece of slow match. Typically, a two-man team operated a 15th-century handgun. One man aimed the weapon and the other applied the ignition. Hand-held firearms were not refined until the following century. A soldier fires a so-called hand-gonne consisting of a short tube mounted on a stick. He ignited the gunpowder through a touchhole using a hot coal or piece of slow match. Even though the Wars of the Roses lasted for three decades, pitched battles were infrequent. When fighting did take place, however, it was extremely brutal. For example, it is estimated that the combined casualties of approximately 28,000 from the Battle of Towton constituted one percent of the total population of England at the time. The Wars of the Roses are remembered for the large number of high-born males who were killed in battle or later executed. With the exception of crude gunpowder weapons and the longbow, combat was conducted at close quarters. In order to kill or wound an oppo- nent with one of the hand-held weapons of the day, an attacker had to be as close as two to three feet to inflict a lethal blow. Unless a fighter was wearing heavy armor, one blow or stab from a poleaxe or sword could prove fatal or at the very least disable an enemy fighter. The number of participants involved in any given battle during the Wars of the Roses is dif- ficult to determine, and casualties are even harder to ascertain. Battles tended to be blood- ier just by the violent nature of the combat. Defeated armies rarely retreated in any orga- nized manner, making retreating troops an easy target for enemy cavalry. Tags 15th century, Agincourt, Archery, axe, Battle of Barnet, Battle of Towton, Battle of Wakefield, battlefield, billhook, blades, Bridport, cannon, Castillon, cavalry, Celts, CIA, close combat, Crécy, dagger, Duke of York, EAM, Earl of Warwick, Edward I, Edward II, Edward III, ELAS, England, flail, French, German, Germany, glaives, halberd, hand-gonnes, Henry Tudor, Henry V, Henry VI, Hundred Years' War, Italy, javelin, King Edward I, King Edward IV, King Henry, King Henry V, King Henry VI, Knife, knights, lance, Longbow, mace, Mary, medieval war, medieval warfare, military, missile, Normans, NSA, OSS, pike, Plantagenet dynasty, Poitiers, poleaxe, POW, Queen Margaret, red rose of Lancaster, Richard I, Richard II, Richard III, Roman, rondel dagger, sheaves, spear, st. albans, sword, swords, Tern, Thor, Tory, Viking, Wars of the Roses, weapons, white rose of York, WIN.